It’s that time of week when my friend Janet Cassidy and I are talking home gardening, harvesting and recipes to use that produce in. This week we focus on blackberries that you can grow in a container and also the traditional blackberries that grow directly in the ground. In today’s share I’m potting up a great trial plant I’m growing from friends at Brazel Berries so be sure to check the video below showing just how it’s done! Good night blackberry plant in the dome garden… taking the harvest indoors! blackberry shrub in the dome. Blackberry plant is looking happy after being planted in new container. In this presentation join me and my friend Janet Cassidy as we share our experience with blackberries. 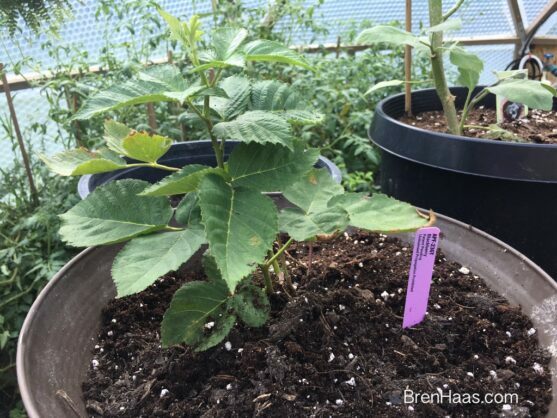 I’m potting up my thornless blackberry plant that will be added to the the geodesic bio dome garden while Janet and I chat about our experience growing and harvesting the berry. Don’t forget the recipe share….. you’ll find some great recipes you can use from your berry harvest or the fruit you pick up at your local farmers market. During the hot days of summer I can’t wait for the berry harvest in my area. After the early summer strawberry harvest I love to throw in my Vitamix just about any berry that is fresh and sweet from local growers. Before the presentation shared above I mixed up a blackberry smoothie and let me tell you it was SUPER refreshing on this hot day out in the meadow talking berries with you all! Below is the recipes I use and a ‘printer friendly’ addition if you’d like to print it and add a hard copy to your cookbook. Chop the banana into 1" pieces before adding to the Vitamix Blender. Add the blackberries, Frozen Banana pieces, chopped Kale to the vitamix with 1/2 of the Almond Milk. Proceed to start blender on smoothie setting. Slowly add remainder of the milk and sprinkle in cinnamon. Image is from Ponce Photography. The best blackberries are the ones that are harvest when completely ripe. If you pick a berry too soon they may taste bitter and not as sweet as a completely ripe fruit. Below are a few recipes you’ll love to try out so be sure to click and bookmark them to use after your next blackberry harvest. Beautiful frozen blackberries from Janet Cassidy’s Garden. During the presentation I demonstrated how to grow a blackberry plant in a container. Be sure to follow the tips below for successful growing in your home garden. Grow a container variety plant. This is the Baby Cakes Thornless Dwarf Raspberry Plant I’m growing in my dome. Blackberries like acid in the soil so be sure to use the proper food for the plant. Below is the product I’m using in the container my raspberry is growing in. You can order your own bag of healthy grow on Amazon Here. Do not over water the plant in containers. During the winter months in the colder season be sure to mulch the container and store in a safe spot outside. The plant can also be grown in a greenhouse over the winter months. 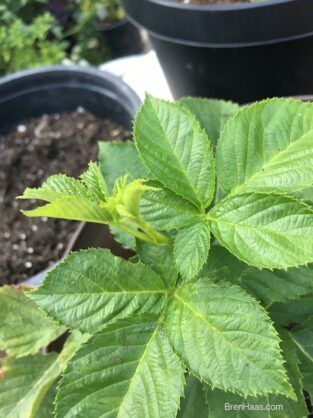 [alert-warning]Are you ready to grow some blackberries of your own now? I hope so!!! 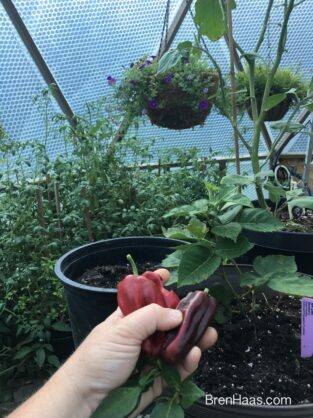 I’d really love it if you shared a comment below to let me know what you think about growing berries in home gardens and if you have any questions please share as well. I want to thank you for stopping by my site today because your time is appreciated. If you have a topic you’d like to request for Janet and I to cover in the weeks to come please comment below.